Just 5 months after we met in 2001, Don and I produced our first Christmas CD for family and friends. This was our Christmas card. It quickly became our family tradition that grew annually to the point where we were burning 200 disks each Christmas by 2010. 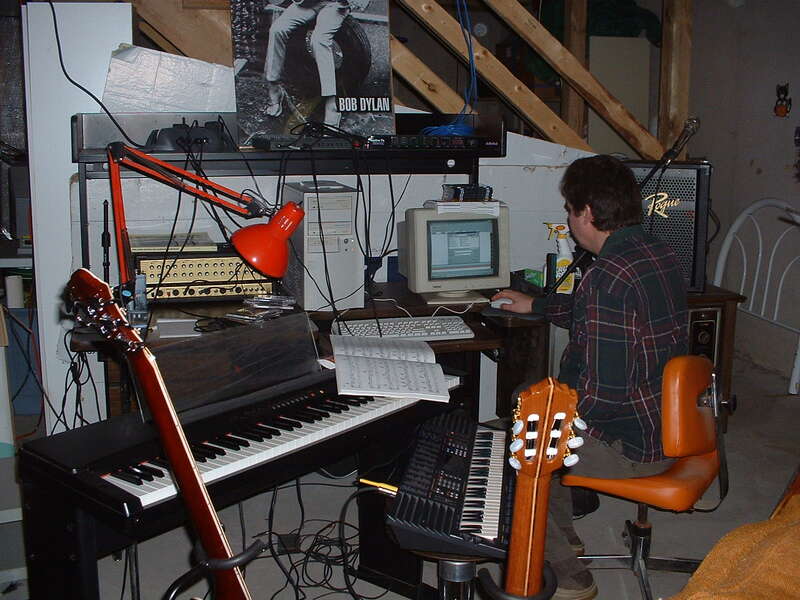 Our basement recording studio in 2003. Over the years our recording studio moved from the chilly basement to the living room to Kimber's old bedroom, now dubbed "The Music Room." Don was the brains and talent behind the effort. He managed the complex connections between computer, musical instruments, microphones, audio interface, headphone amp, and so on. When every part was working together properly, it was time to record. We performed everything ourselves; Don would not tolerate any karaoke background tracks. He plays acoustic guitar, electric guitar, bass, ukulele, and occasionally sings. 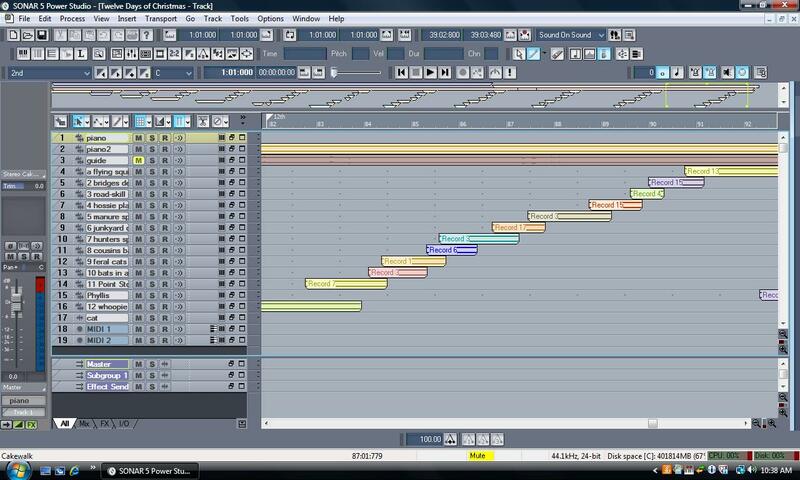 I play keyboard and sing a wide range of parts from tenor to soprano often on the same recording. After recording, Don would mix the tracks, output to a .wav format, and burn to CDs. In the meantime, I would design and print the cover art. Recorded tracks for "The 12 Days of Christmas in Wrayville. Sadly we haven't recorded since 2014, though I have never given up hope that there is another one in us. Be sure to coax Don when you see him. Below are some of my favorites. And for 2018 I've loaded all the albums to this site. 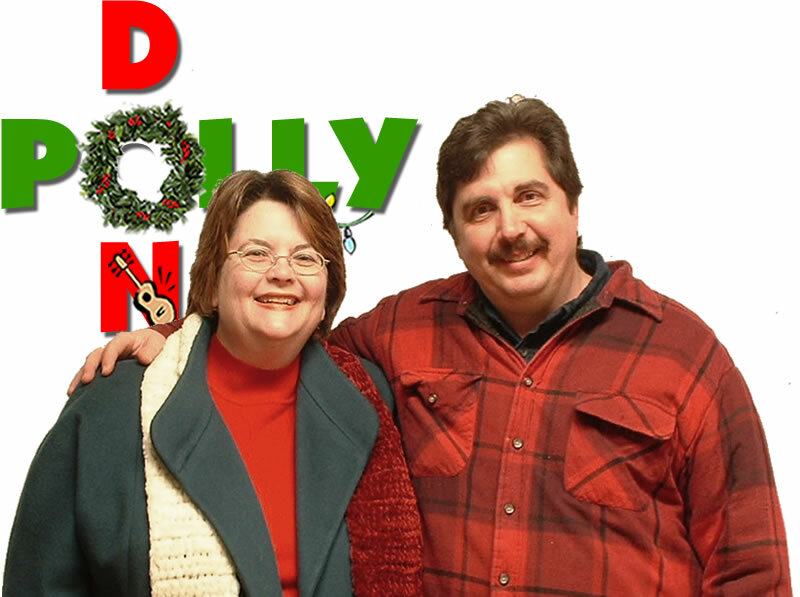 Click on the selections and enjoy the sometimes funny, ocassionally embarrassing, and randomly lovely Christmas sounds of Polly and Don.